1 The time for submissions needs to be extended to allow further studies and submissions and you have not provided copies of current Franchise documents for evaluation. 2 The document you provided permits the bus companies to continue using Euro 1 and Euro II through Euro V vehicles whereas existing Franchise documents already require that any replacement vehicles must be of Best Available Current Technology which is Euro V (soon to be Euro VI). Any new deal means the companies should comply with BACT rather than outdated polluting current buses. 3 Transport department should not be making unilateral decisions that would impinge on other departments’ responsibilities namely, Air Quality. 4 Roadside pollution in Hong Kong is already diabolical and rates next to the worst performing 3rd world countries in the emissions of lethal PM2.5. which comes from the combustion of fossil fuels. 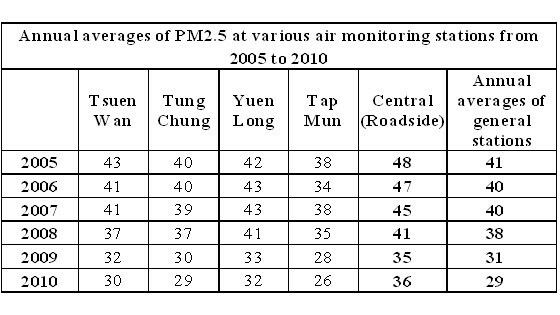 The Central roadside PM2.5 levels are nine times higher than Vancouver and double those of Singapore. Mongkok and Causeway Bay are worse. 5 There seems to be no incentive to allow the bus companies to bring in hybrid buses which would be best suited here given the topography and hills. 6 There should be a date set and made known to all that certain areas will be designated Low emissions Zones where only Euro V or later or hybrid / electric buses will be allowed to operate. Setting this into Law will make the bus companies comply accordingly. 7. Transport Department personnel and their children have to breathe the same pollutants as the public and they should realise that health and environment come first and the profits of the bus business tycoons last. If you thought it was a pain to drive in Montreal or Toronto, think again. According to results of a survey, it’s not nearly as frustrating as driving in Mexico City or Beijing. In its fourth annual study, IBM selected those Canadian cities among the world’s top 65 cities. Montreal was ranked as the least-painful city in which to drive, while Toronto was ranked the fifth-least painful. Mexico City, Shenzhen and Beijing were ranked the three worst cities in which to be behind the wheel. A new World Health Organization database on air quality places Canada as one of the world’s top nations when it comes to clean air, but an expert says despite this country’s high scores, the air Canadians breathe will still cause health issues for thousands. The international public health authority on Monday launched its first Air Quality database, which covers almost 1,100 cities in 91 countries, revealing the world’s hot spots for air pollution as well as regions with the highest health burden due to poor air quality. Data on particulate matter, a kind of air pollution that results in particles floating in the air, were compiled from national records, websites and scientific articles to create the database. Compared with 90 other countries, Canada tied for third with Australia following Estonia and Mauritius in a ranking that looked at how many air pollutant particles were recorded in a cubic metre of air in each country. “Canada did indeed score very well, which shows Canada has been taking good action over the years,” said Annette Pruss-Ustun, a scientist in the WHO’s public health and environment department. However, Pruss-Ustun said even the smallest amounts of particulate matter in the air can affect someone’s health. The WHO estimates that 1.3 million people – with more than half of them in developing countries – die every year from outdoor air pollution. About 2,400 people die every year in Canada as a result of air pollution. The database looked at two sizes of particles – those that had a diameter of less than 2.5 microns (or PM2.5) and their bigger, less hazardous counterparts, which were at least 10 micrometres large (PM10). The individual particles aren’t visible – a 10-micrometre-wide particle is easily 50 to 100 times thinner than a strand of human hair. In Canada, there was an annual average of 13 micrograms of PM10 particles per cubic metre of air while Estonia had 11 and the country with the most air pollution – Mongolia – had 279 large-sized particulates in a single cubic metre of air. Sarnia, Ont., surrounded by oil refineries in a region that also shares a border with Michigan, topped the Canadian list. It documented 12.7 micrograms of PM2.5 particles per cubic metre of air, which was on par with population-dense New York and was just 0.4 fewer than Madrid and foggy London. Montreal, with 11.2 PM2.5 and Windsor, Ont., at 10.1, trailed Sarnia while Toronto, recorded 7.9 PM2.5, almost twice as much as Metro Vancouver. Includes the year of the last sample, followed by the number of micrograms of particulate matter at least 10 micrometres in size, per cubic metre of air. and restaurants opened at ZHA. The annual standard for PM2.5 is met whenever the 3 year average of the annual mean PM2.5 concentrations for designated monitoring sites in an area is less than or equal to 15.0 µg/m3. The levels are 2 ½ to 3 times higher than the US legal permissible amount. PM2.5 is 1/30 the width of a human hair and enters into the lungs unhindered. 1983 Gordon Wu proposes the idea of the bridge. 1989 Zhuhai publishes the Lingdingyang Bridge program. 1997 China’s central government shows support for the Lingdingyang Bridge program. 2002 (November) Zhu Rongji, the Premier of China at that time, shows support of Wu’s idea. 2003 The Chinese government shows support of the idea. 2003 (July) Donald Tsang, the Chief Secretary for Administration of Hong Kong, goes to Beijing to meet with the Chinese government about the bridge. 2003 (August) The Hong Kong-Zhuhai-Macau Bridge Advance Work Coordination Group was established. 2007 (May) On 17 February 2006, the HK Airport Authority (ie the HK Government as sole shareholder) confirmed it will hold 55% stake in a company that operates the Zhuhai Airport, with the remaining 45% owned by Zhuhai Airport. The company will not own the assets or the liabilities of the airport. HK Government also announces its intention to get involved in the expansion of Nansha. Zhuhai airport serves Chinese Mainland destinations. 2007 May – Seabed feasibility study began. 2008 (August) China’s Central Government, the governments of Guangdong, Hong Kong and Macau agreed to finance 42% of the total costs. The remaining 58% will consist of loans (approximately 22 billion yuan or 3.23 billion US dollars) from Bank of China. 2009 (March) China’s Central Government, Hong Kong and Macau agrees to finance 22% of the total costs. The remaining 78% will consist of loans (approximately 57.3 billion yuan or 8.4 billion US dollars) from a consortium of banks led by the Bank of China. 2009 (December) Construction of the bridge begins. Vice Premier of Chinese Government Li Keqiang took charge of the commencement ceremony. comparison of air quality was not necessary, since the administration was in any case required to minimise pollution. A global air pollution survey by the World Health Organisation ranks Beijing near the bottom of a list of nearly 1,100 world cities. Despite its brief success in combating smog during the 2008 Olympics, Beijing is now the 10th dirtiest capital city in the world, only cleaner than Ulan Bator, Gaborone, New Delhi, Islamabad, Riyadh, Dakar, Cairo, Dhaka and Kuwait City, according to WHO’s first global survey. Even more embarrassingly, the capital ranks 26th among the 30 mainland cities included in the study, with its 2009 reading of PM10s (tiny vehicle and dust particles of 10 micrometres or less) of 121 micrograms per cubic metre. Ma Yongliang , of Tsinghua University, said the ranking underlined the gap between Beijing and international metropolises in industrialised nations in terms of pollution control. “We’ve achieved great progress, but apparently there is much room for us to catch up,” he said. Hong Kong, Macau and Taiwan are not included in the rankings, but pollution data of mainland cities are based on the China Statistical Yearbook 2010. According to the yearbook, Hong Kong’s annual mean reading of respirable suspended particulates, which usually refers to PM10s, was 47 in 2009, which would rank the city 870th along with Manila and Turin, Italy. Hainan’s Haikou , which scores the best among mainland cities, ranks 814th on the pollution scale, with an annual average PM10 reading of 38mcg per cubic metre. Lhasa and Nanning come second and third, while Guangzhou ranks sixth with 70mcg. The WHO recommends an upper limit of 20mcg for PM10s, which can cause serious respiratory problems, including lung cancer. A chill wind is sweeping across the factory supply chain in front of a looming global recession. From manufacturers in the Pearl River Delta, to freight forwarders and package delivery services in Hong Kong, to retailers and shoppers in the United States and Europe, confidence is falling sharply. The spiralling euro-zone sovereign debt crisis and a lack of faith in US plans to push down interest rates have already cooled spending in advance of the Thanksgiving and Christmas seasons. “We can’t feel even a tinge of Thanksgiving as the market is extremely quiet now,” Toll Global Forwarding (HK) managing director Kelly King said. Demand was abnormally sluggish for this time of year, traditionally the peak season for the air and sea cargo industry, he said. The air freight rate from Hong Kong to Europe fell to HK$15 per kilogram this month, down from HK$18 to HK$20 per kilogram in June, King said. Even with sharp rate cuts, carriers and cargo agents found it tough to fill cargo space on the Europe leg. With just 13 weeks to go to Christmas, shipping lines and freight forwarders are seeing little of the surge in shipped goods of last year. Airlines had cut their cargo flights and grounded some aircraft, King said. FedEx, operator of the world’s biggest cargo airline, yesterday lowered its earnings forecast for this year by 10 US cents per share on falling shipments for the second quarter in a row in the US. FedEx chief executive Fred Smith said the company expected sluggish economic growth to continue. Rival UPS also said last week that the US economy grew at a slower rate than it had anticipated. Hong Kong Garment Manufacturers Association chairman Willie Fung Wai-yiu said the confidence of overseas importers and consumers was battered. In some cases, buyers have ordered a container of garments to be delivered within four weeks. Fung said the normal lead time for production of fabric alone was four weeks, not counting production and shipping of the garments. Federation of Hong Kong Industries deputy chairman Stanley Lau Chin-ho said the bleak outlook on trade – combined with issues on the mainland, such as industrial reform, cost inflation and labour shortages –would intensify a survival-of-the-fittest struggle in the Pearl River Delta. Hong Kong Air Cargo Terminals, (Hactl), which handles 80 per cent of the cargo at Hong Kong International Airport, recorded its fourth consecutive monthly decline in cargo volume last month. “There is no sign of optimism,” Hactl marketing and customer service general manager Lilian Chan said.The ongoing relocation of mainland factories further inland amplified the drop in air cargo in Hong Kong, she said. Time series approaches to studying the effects of air pollution at daily time scales have important limitations. Until recently, technical and data limitations have prevented the extension of these methods to shorter (such as hourly) or longer (weekly) effects. Because the effects of short term exposure are typically subtle, large populations must be studied to achieve sufficient statistical power, particularly if the focus is on specific health outcomes. The potential confounding effects of factors that vary with time, such as ambient temperature, need to be allowed for. Estimates of exposure that are based on measurements at urban monitoring stations may not be representative of exposures experienced indoors, while travelling, or while exercising. Bhaskaran and colleagues tackle many of the limitations described above.1 They assembled data on nearly 80 000 diagnoses of myocardial infarction from 15 cities and assessed the effect of changes in exposure to air pollution from several hours to several days before onset. Exposure to air pollution was higher one to six hours before the event than in matched control periods. There was, however, no overall increase in risk associated with exposure over the three days before admission to hospital. As the authors state, this suggests that ischaemic events that would have occurred soon were merely brought forward by a few hours. Epidemiological evidence of the effects of hourly exposure to air pollution on cardiovascular events is mixed. In a recent review, four of five studies reported significant associations between hourly exposure and myocardial infarction.8 However, only one of these studies analysed data over sufficiently long periods to exclude short term temporal displacement as the main explanation for the results.9 Several daily time series studies suggest that exposure to air pollution increases the risk of myocardial infarction over longer exposure periods (typically, the day of admission and the previous day).10 11 In those studies and in a multi-city study of mortality,12the effects were not primarily the result of short term displacement of health events. How should Bhaskaran and colleagues’ results be interpreted? The prevalence or severity of cardiovascular disease might be lower in England and Wales than elsewhere. Alternatively, the estimates of exposure to air pollution might be less representative than in other settings. Either of these factors would reduce the power of the study to detect a true effect, although neither would explain the temporal pattern of the results. Despite the strengths of the study, it is possible that a true effect was missed because of imprecise measurements and inadequate statistical power. In general, low levels of acute exposure to air pollutants can have minor effects in healthy people and trigger more serious events only in sensitive subpopulations. However, as shown by cohort studies, over several years even low levels of exposure to air pollution can reduce life expectancy substantially. An increase in the prevalence of chronic cardiorespiratory conditions is probably the most important mechanism for the reduction in life expectancy associated with exposure to air pollution over years or decades. Studies of very short term exposure may improve understanding of the early physiological mechanisms of the effects of air pollution, but they are not the best basis for developing policy on the control of air pollution. Given other evidence that exposure to air pollution increases overall mortality and morbidity, the case for stringent controls on pollutant levels remains strong.